The view here is looking eastward across the Old City, the vantage point a rooftop, or perhaps the city wall, in the Christian Quarter. The large gray dome (bottom) is the Church of the Holy Sepulchre; beyond that the distinctive Dome of the Rock sits atop the Haram al-Sharif/Temple Mount; and on the skyline is the Mount of Olives, punctuated by the tall Russian Ascension bell-tower. 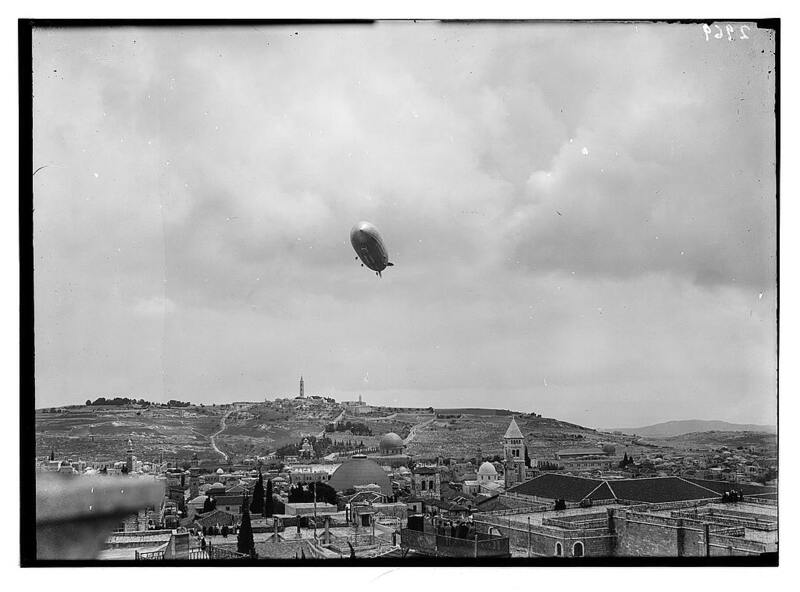 The photo depicts what is actually a well-documented event: the visit of the German dirigible Graf Zeppelin to Jerusalem on April 11th, 1931. The famous airship had begun it’s brief journey to the Middle East on April 9th from its base in Friedrichshafen, Germany, and it landed at Heliopolis near Cairo at dawn on the 11th. That same morning, it set off on a one-day, round-trip sightseeing excursion to Jerusalem, reaching there at 10 a.m. in conditions of intermittent rain. The airship reportedly hovered for some time, with its engines stopped, about 100 meters above the Church of the Holy Sepulchre, and that seems to be exactly what was captured in the featured image (top). That date – April 11th, 1931 – happened to be Holy Saturday in the Orthodox Christian calendar, thus the dirigible’s passengers were able to view a colorful spectacle being played out below: the masses of people gathered for the annual “Holy Fire” festivities. It is an Easter spectacle which has been observed since Medieval times at the Church of the Holy Sepulchre–and indeed spills out in a wild display through all the surrounding streets. While at Jerusalem, the great airship also hovered over the Dome of the Rock, the German Consulate, the Schneller orphanage and school (a German-supported institution on the western edge of the city), and the British High Commissioner’s residence at Government House (today’s UN headquarters) on the southern rim of Jerusalem’s “holy basin”. After this brief visit, without ever touching down in Palestine, the Graf Zeppelin (average speed approx. 100 km/62 miles per hour) returned to Egypt and landed in Cairo at 4 p.m. the same day. It arrived back in Germany, via Constantinople, on April 13th. The Graf Zeppelin (D-LZ 127) was a German-built and -operated, hydrogen-filled, rigid airship which flew commercially from 1928 to 1937. The largest such craft of its day, it was the pride of Germany in the years between the World Wars, carrying its passengers in great luxury on such journeys as an around-the-world tour (1929), a polar expedition (1931) and, during its final five years, regular passage between Europe and South America. The Graf was abruptly withdrawn from active service the day after the loss of the Hindenburg in May 1937, but during its operational life the airship made 590 flights covering more than a million miles. Another article a few days later [▼BELOW] noted the field day local photographers had documenting the dirigible’s visit! Stamp issued in 2001 commemorating the Graf Zeppelin’s 1929 visit. This is one of a series of posts highlighting images produced by the Photo Department of the American Colony of Jerusalem (and later by Eric Matson, working independently), between about 1897 and 1946, as well as other aspects of Colony history. The springboard for some of these posts was work I did in collaboration with Todd Bolen on his digital publication project of American Colony/Matson images. For more background on the Colony, see my on-line article “Jerusalem’s American Colony and it’s Photographic Legacy“. This entry was posted in American Colony, Church of the Holy Sepulchre, For FUN (mostly), JERUSALEM, Modern History, Photography, Stamps and tagged American Colony, dirigible, Graf Zeppelin, Jerusalem, Photography. Bookmark the permalink. Nicely done, enjoyable and informative article.